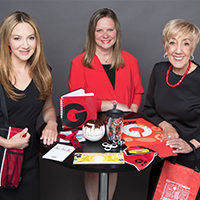 Geiger is the largest family-owned and managed distributor of promotional products in the United States. Promotional products are proven to help you connect with your customers, prospects, and employees. Sarah, Laura & Vickie take a consultative approach to your current marketing or promotion challenge. No matter the need, we will work with you to create and implement high-impact programs to get your desired results - cost effectively and responsibly. At Geiger, we combine ideas with creativity to create Brandspiration! Find out how promotional products can help your company find solutions.